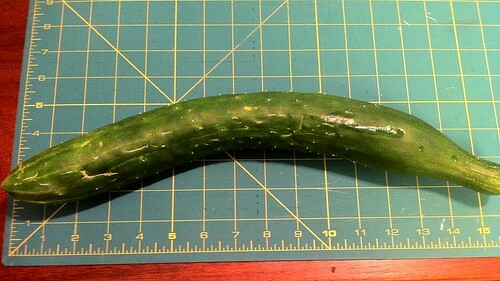 Our garden produced another spectacular cucumber and I did not want to make the same salad as the last time so I had this in mind when I went to the farmer’s market. One of the sellers had bags of mixed baby greens and vine ripe heirloom tomatoes. What I came up with is this salad. 2. Rinse and dry mesclun and spread out on a large serving plate. 3. Sliced the tomatoes thinly and overlapped the red ones around the edge of the plate and then lay a tight ring in the middle with the yellow tomatoes. 4. Peeled most of the cucumber, leaving 5 thin strips running the length of the cucumber and slice the cucumber into ¼ inch rounds. 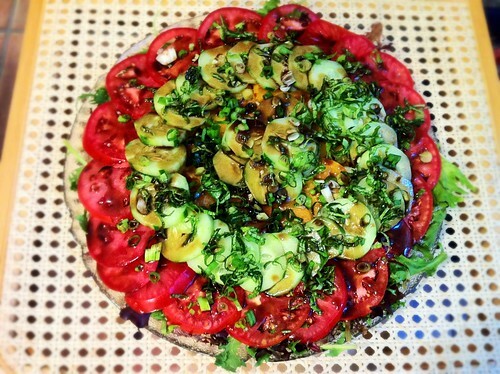 Overlap the cucumber rounds between the tomato circles and in the center of the salad. 5. Thinly slice the green onion, chiffonade the basil and scatter over the salad. 6. Sprinkle the dressing over the salad and serve.